Black, Asian & Minority Ethnic (BAME) groups represent 31% of the active transplant list but only 6% of the deceased donors and 16% of the live donors. • Transplantations are more successful when the donor and recipient are from the same ethnic background (due to blood group and tissue type compatibility). • As a result, BAME group patients wait on average 1 year longer than their white counterparts. If you are black or south Asian, you're more likely to develop kidney problems. This is because you're more likely to have diabetes and high blood pressure than the general population. These are both common causes of kidney disease. 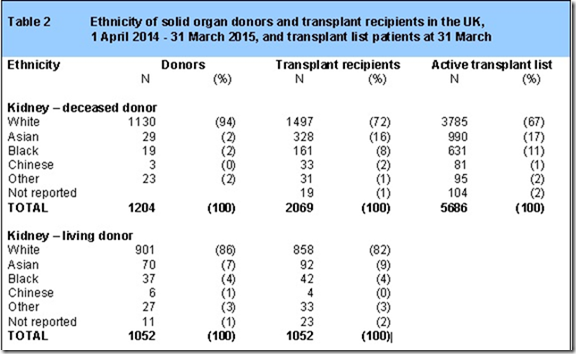 6% of deceased donors are BAME but 33% of the active transplant list is BAME. There were only 51 deceased donors of Asian, Black or Chinese origin but there were 1702 patients of these ethnic backgrounds on the active transplant list. 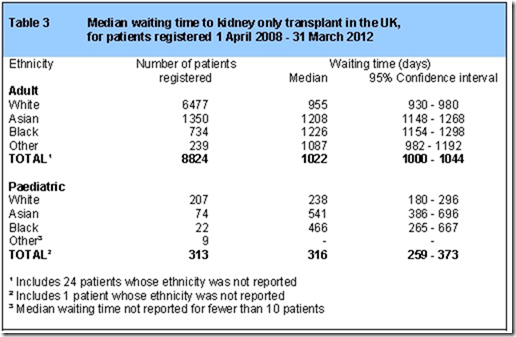 29% of patients the transplant register are Asian or Black but only 4% of the deceased donors. 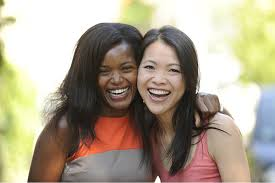 The Asian, Black and Chinese communities are more reliant on living donors. There are roughly twice the number of living vs.deceased donors compared to those of white ethnicity. The following tables show the source of these facts. The source document can be found here. Important videos made by the Black & Asian Communities. People have made these appeals to their communities for more people to join the organ donor register. This film was published in July 2011 by the Hindu Forum of Britain, the Hindu Healthcare Society and BAPS Charities in partnership with the Department of Health.